But the joy was there, despite the dampness. The bells began with a joyful Dobrinski prelude. Then after the ringing of the bell, the liturgy began from the chancel as Pastor gave the apostolic greeting, prayed the collect, and read the Palm Sunday Gospel. Bells and trumpet and organ led off with the beautiful processional hymn of Theodulph of Orleans, sung throughout the world on this day, "All Glory, Laud, and Honor." The children of the school, who formed our choir today, followed the cross, torches, and Gospel book as they waved their palm branches and the hymn came to life before our eyes and ears: "To whom the lips of children made sweet hosannas ring!" The joyful procession leads to the solemn veiling of the crosses and then the long liturgy begins. Our pastor is not trimmer. He gives us the lot. So the service of readings (Zechariah's prophesy / gradual / Philippians 2 / tract) commenced, culminating in the Passion of St. Matthew, the 26th and 27th chapters of His Gospel, read with reverence. Onto the Nicene Creed and Hymn of the Day: "A Lamb Goes Uncomplaining Forth" in which the children sang the second stanza. After a homily that summoned us to awe at the love that our Lord Jesus is revealing to us by His passion, the offertory and offering and intercessions, and then the Service of the Eucharist commenced. Pastor (wisely!) uses the crisp old Preface for Lent (the traditional preface for the feasts of the Holy Cross) from The Lutheran Hymnal and not the wordy version that appears in our current book (which by seeking to be clear ends up being merely pedantic). As always the Sanctus on this Sunday with its Benedictus qui venit rang with particular joy. Again, by the gift of the liturgy the events of the day are brought to us for us to participate in and receive with joy. Distribution rang long enough that we ended up singing all the Distribution hymns ("Hosanna, Loud Hosanna," "O Bride of Christ, Rejoice," "No Tramp of Soldier's Marching Feet") and so the children sang for us their memory verse for this year from Psalm 46: "Be still and know that I am God." They sang it first in Latin and then in English and in harmony. So beautiful. After the Nunc Dimittis, collect of thanksgiving and closing salutation, benedicamus and benediction, the liturgy closed with a hymn that I always find the most moving of all for Palm Sunday: "Ride On, Ride On in Majesty." "The Father on His sapphire throne Awaits His own Anointed Son." And, of course, trumpet with the organ to send us off. It was a feast of the Word, a feast of prayers and music, and above all, a feast of that sacrifice from the Cross which sustains our life in Christ across all these centuries and will ever till He returns in glory. The liturgy lasted an hour and twenty minutes. Hosanna to the Son of David! Blessed is He who comes in the name of the Lord! Hosanna in the highest! 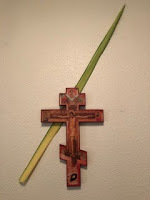 Our palms got moldy, but we still had a procession and a beautiful Palm Sunday service just without palms this year!